We had such a terrific Independent Bookstore Day that we're celebrating into the week with an extra 25% savings off our already half price sale cart items! Shop early for the best selection. We also have signed books left over from Ron Base's signing while supplies last and a few special IBD items like the Dragons love Books onesie and the Colson Whitehead pouch. 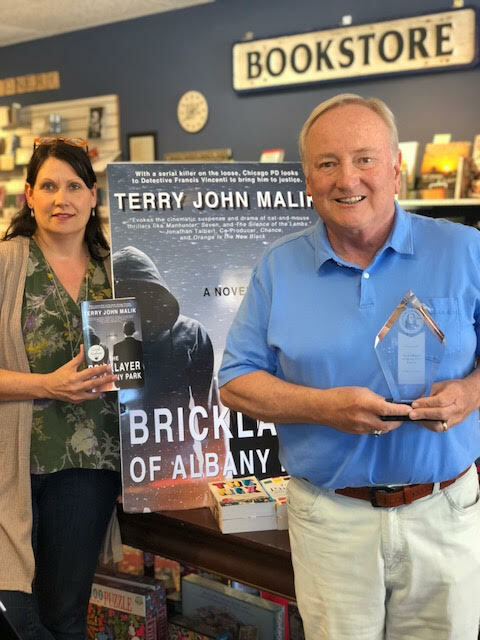 We're congratulating local writer Terry John Malik on winning the Gold in the I.B.P.A Benjamin Franklin Award Program for his debut mystery the Bricklayer of Albany Park. Copies are available in the shop and Terry will be here on May 26th from 10-12 if you'd like to chat with him and have your book personalized. And, last but not least, Book Club will meet Thursday, June 5th at 6 p.m. We'll be reading Lillian Boxfish takes a Walk this month by Kathleen Rooney. Hope to see you there!